What Deborah Hopkinson does exceptionally well with her book, Titanic: Voices from the Disaster, is essentially resurrect the Titanic and truly bring the voyage and its passengers to life for readers. Sure, she touches on all of the important historical markers, but the heart of the Titanic is the hundreds of lives that were lost after errors and bad decisions compounded one on another. I don’t think the phrase “women and children first” ever meant more to me than when I was able to put it in the context of the Titanic, where so many fathers and sons and brothers drowned in the icy Atlantic with barely a chance to say goodbye to their loved ones. And up until now, many readers probably didn’t know much about the passenger stories. Any programs I hear about that cover the Titanic focus on the captain and crew, maybe on an odd passenger here and there, but mostly emphasize the events themselves. I appreciated how Hopkinson talks about the sorry plight of third class passengers, but that she does so by introducing readers to the personal stories and journeys of many of those passengers through documented accounts from survivors that were able to tell the world not only their own story, but the story of friends and family who never made it home from the voyage. And Hopkinson’s writing style is captivating. Like a cherished family album, she points to this and that person, describing their journeys — either ending in doom or in miraculous recovery. And there are plenty of stories that raise the hairs on the back of your neck, like the crewman who chose not to accompany the ship on its voyage across the Atlantic after seeing “a bad omen” as the ship’s resident cat slowly carried her kittens one by one down the gangplank and off the ship before it sailed. Best of all, Hopkinson provides endless resources to readers for continued Titanic “story hunting.” I didn’t even know that these sites existed! For example, as we learn in the book, many of the surviving photographs of the Titanic we have today are thanks to Father Browne, who rode with the Titanic through her early ports but never joined her on the final leg of the journey across the Atlantic. 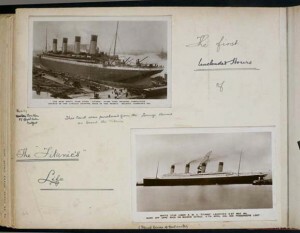 The Father Browne website features his personal story and some of his own Titanic photo album. (Both of the photos in this post were borrowed from that site.) A wealth of information can be found on Encyclopedia Titanica, including full passenger survivor lists with detailed information on the survivors, deck diagrams, articles, and more. I particularly liked how they even grouped survivor lists by their rescue boats, and how they also provided lists of names for both survivors and the people who were lost. But perhaps my favorite resource notes from Hopkinson were links to the BBC’s archived audio recordings of actual Titanic survivors sharing their personal recollections of the voyage and the disaster. I couldn’t help but take a brief listen to the survivors — like Commander C.H. Lightoller, Edith Russell, Commander Joseph Boxhall, Eva Hart, Edwina MacKenzie and more — using their own voices to share their stories. 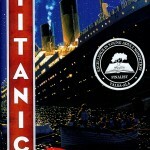 This book is not James Cameron’s Titanic. Hopkinson’s Titanic is a collection of real, living, breathing individuals who struggled and dreamed and dared to make a journey across the Atlantic that was meant to bring them to better lives or into the arms of distant relatives and instead brought them tragedy and poverty. These personal stories make all the difference in telling the story of this disaster. Hopkinson’s book provides the “color” that really makes the story of the Titanic more than just an entry in a history book. For that reason, it earned a well-deserved place as a finalist on this year’s short list for YALSA’s Nonfiction Award.